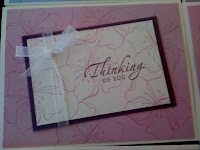 I recently got a call from my mom informing me she was low on greeting cards. This means that my sister-in-law or I need to replenish her card stash since we both do paper crafts. I decided on projects, all of which I'd done before, so they were able to be done quickly. 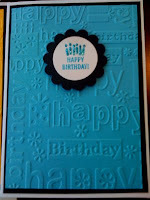 The birthday cards are made with a Cuttlebug embossing folder, stamps, and coordinating colored paper, ink and Stickles glitter. The scallop punched disc is mounted with a dimensional dot. 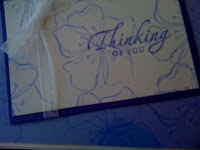 The Thinking of You and Sympathy cards were also done with Stampin Up stamps where the background floral stamp was done on the white and colored card stock at the same time, and the contrasting color frame added later. Many probably won't notice that the flower print matches between the two, but you can see it well in the purple card image. 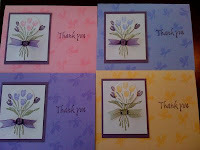 The Thank You cards are done with multi-part stamps and I used a stamp-a-ma-jig to align the flowers to the stems. 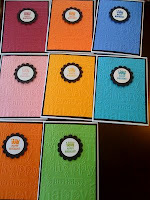 Coordinating colors were used on separate paper and a round punch. Discs were overlayed to roughly line up with background image. 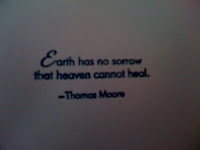 The interior text is printed with coordinating color ink. 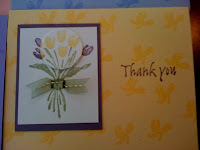 My pet peeve is poorly inked interior messages...they look like an afterthought and ruin an otherwise quality made card. So I try to make sure that my stamps are inked very well. 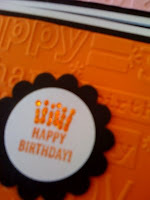 A fun little finishing touch is a personalized stamp. 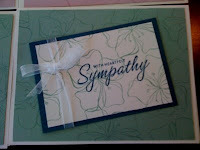 Mine was purchased by Stampin Up but the quality is pretty bad. 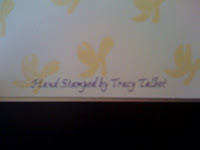 I need to find a better quality stamp maker for personalized stamps. I hope mom likes them!